. Bright night, with thick cloud followed by high humidity. Got only a few spectra before the clouds were too thick to do anything else.
. Bright night, with thin cloud and good seeing (steady at ~1", then up to 1.5", then back down to 1").
. Clear, bright night, with excellent seeing (mostly 0.5"-1.1").
. Thick cloud and high humidity. Unlike your Christmas presents, there was nothing being opened tonight!
. BCAM testing data for 2012-2-POL-007.
. Warm, clear night with good seeing (0.9"-1.5"). 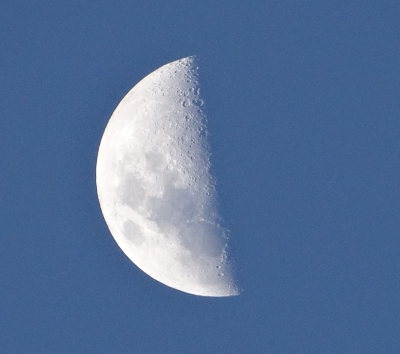 Bright night: 98% moon from twilight through twilight. => Clear night, but we were closed by humidity at midnight. Others: Tamara, Dima and Matthias for a while. No any observations because heavy clouds and rain. => Clouds up to the middle of the night and stable weather after that with variable seeing. => Cloudy, very unstable night with seeing around 1.2-1.3". Heavy clouds in the evening time and some fields of clouds during the night. => Clear, stable night with good seeing. Productive. => Unstable night with variable seeing. Others: Emma, Siphelo initially; Deatrick & Jean-Marc later on. Thick clouds hampered first half of night, but mostly clear by midnight. Clear weather at sunset - at last. Quite a productive night in the end, despite seeing steadily deteriorating as wind swung from SW to SE. Managed to observe an SN ToO for Dan Milisavljevic at short notice. Plus knocked off most of the outstanding accumulated spectrophot & Lick standards. "Thunderbolt & lightning, very very frightening me, Galileo, Galilieo...." at the start of the night. Lost power, so on generator. condition were photometric and seeing 1.2-1.8"
Clouds dispersed during the first half of the night, but humidity increase and dew point limit was hit all night. Welcome to Anti-Doomsday Day Night! Electrical storm from early evening, culminating with loss of Eskom, a strike on SALT, loss of comms to CCAS, BMS and excternal weather/ELS, and general crippling. Did some stray light tests. Thanks Martin for the pictures and Willie for posting them! Lots of tech issues resolved by a talented team of elite SALT personnel. Seeing was an awful 2.5-3.0". Accepted one observation for 2012-2-RSA-001 before ridge cloud forced us to close at 00:35. Night lost due to high humidity. An evening storm, a twister(!!!! ), a spectacular sunset and a night of thick clouds, high humidity and lightning. Sutherland put on quite a show. No observations. Closed around 23:10 due to high humidity. Ominous clouds arrived later to impart their own touch of... je ne sais quoi...malice? An unstable with abysmal seeing, thick clouds and ridge cloud. Only had chance to take a few specphot stds from backlog. Others: Keith, Steve C and David B. All night lost to rain and clouds. to a night of extreme winds and ridge cloud. No science. high humidity, high wind, and ridge cloud all night. no observations. thoughts go out to our colleagues at AMNH and RU who are right in the path of hurricane sandy tonight. stay safe and dry! object may be a good candidate for future human space missions. of the maximum available track length. any of the existing narrow band filters. instruments is available in the nightly build of PySALT. observed new type Ia SN in NGC 1365 for 2012-1-RU-005, but didn't complete the block in time. data for 2012-1-RSA_UKSC-005 was impacted by quickly degrading mirror stack so block rejected. attempted block for 2012-1-UW_OTH-002 was aborted due to inability to ID target from provided finder charts. bumpy night weather-wise with highly variable seeing that was awful at times, 4" or worse. worked on fixing the pointing during the first half of the night and made good progress. there was a constant offset in AZ that was nearly an arcminute. that has been fixed and the pointing is at spec at worst and usually better than 10". was able to acquire MOS field without manual offsets in one case. stars came up close enough to boxes for MOSpup to work. observed, but rejected, block for 2012-1-RSA_UKSC-005 because the seeing blew up terribly during the observation. snuck in one lonely block for 2012-1-GU-003 before humidity closed us up at 20:30. RIDGE CLOUD settled in by midnight and the rest of the night was lost in the fog. managed to finally resuscitate the MASS turbulence profiler instrument and update its software so the night was put to some good use. cirussy night that started off very windy, but once the wind died suddenly, the seeing was decent to good most of the night. under 1" for a while and only over 2" on a few occasions. relatively smooth sailing systems-wise with the only slowdowns due to cable wrap problem and mirror stacks that fell apart quickly due to changing conditions. five blocks accepted and another three observed, but rejected. frustrating night with only one block accepted. abysmal seeing during the first half gave way to steady seeing that was at least mediocre in the 2nd half. however, a slew of technical problems slowed things down considerably. first the primary mirror and then the RSS slitmask mechanism. several PCON lockups happened over the course of the night, sometimes at very inconvenent times. on the bright side, my calsys script was fleshed out and tested further. it can now query RSS and configure calsys for flats automatically based on my recipe from the wiki. selecting a lamp will coordinate insertion of cal screen, selection of stage, and turning on of lamp into one command. Others: Tim, Fred, Hitesh, Keith. Clear night with a SE wind that forced us to close due to humidity at around midnight. Others: Charl. Hitesh at the beginning. A beautiful afternoon that turned foggy waaay too early, at around 9:30pm. Entire night lost to fog and rain. Others: Buzani, Nic and Keith for a while. Rainy and foggy night. No observations. Others: Charl for a while. Cold, high humidity night ended with some snow... in October!!! No data taken. Others: Charl and Chris. Nicola for a brief visit. Highly humid night with clouds coming and going and some rain from around 03:25. Cloudy and humid start, clearing and drying up at about midnight and closing up again at 2:30. The whole night lost to clouds and high humidity. started out excellent at sub-arcsec but then blew up later. * short night. closed just before 23:00 due to rising humidity. - frustrating night with a few technical issues. still getting the hang of the new observing setup. closed just before one due to cloud. - not a very productive night. had some technical issues during the night. closed right after 02:00 due to rising humidity. - did some more BCAM testing and its looking good for now. have not tried very faint targets yet. - no observations tonight due to strong winds and high humidity. - BCAM was tested for slit viewing tonight. From the one observation we did, all looked good for a fairly bright target. Bright moon and cloudy conditions did not allow us to test the BCAM performance on fainter targets. - The functionality to move the guide probe from BCAM has also been implemented and guide probe movements from PDET are spot on. The next few nights will be engineering. All night lost to high humidity. A smooth mostly clear night with good seeing. A frustrating night with lots of tech problems. 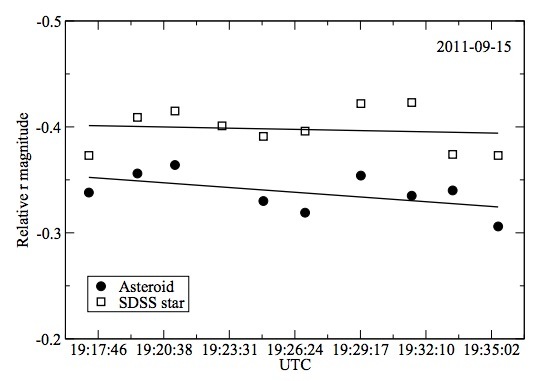 A shame given the seeing was routinely less than 1.5 arcsec. Clear night with revolting seeing. Image taken outside of SALT before a night of observations with a SONY HX200V camera. "Some of my pleasantest hours were during the long rain-storms in the spring or fall, which confined me to the house for the afternoon as well as the forenoon, soothed by their ceaseless roar and pelting; when an early twilight ushered in a long evening in which many thoughts had time to take root and unfold themselves. Men frequently say to me, "I should think you would feel lonesome down there, and want to be nearer to folks, rainy and snowy days and nights especially." I am tempted to reply to such -- This whole earth which we inhabit is but a point in space. How far apart, think you, dwell the two most distant inhabitants of yonder star, the breadth of whose disk cannot be appreciated by SCAM or RSS? Why should I feel lonely? is not our planet in the Milky Way?" A clear relatively stable night with seeing mostly around 1.7". Difficult to schedule many programs due to many being equatorial with stricter track timings. night mostly lost to wind, clouds, humidity, and light rain. conditions cleared after midnight and humidity dropped significantly after 0300. opened and tried to get some data, but the quality of the alignment was poor and changed very quickly. managed to observe one block for 2012-1-RSA-014 which is better than nothing. took a lot of FP engineering data to help characterize the erroneous header issue. also helped train brentski how to do FP. And the sky is not cloudy all night. Where the hell are our stars? thick high clouds in the first half of the night gave way to clear skies and high wind in the second half. humidity spiked during morning twilight as a harbinger of ridge cloud to come tomorrow night. temperature dropped almost 13 C over the course of the night. seeing was good at times, but high winds prevented an alignment good enough to take advantage of it. IQ was so dire at the end that CAL_SPST and a P4 were the only viable options. ultimately completed 5 blocks and rejected two others. fabry-perot was again shown to be compromised by software bugs. frustrating and unproductive night with cirrus and thick haze and numerous technical issues. seeing was steady, if unspectacular. lost much of the first half to some weird PCON bugs that prevented us from successfully taking any fabry-perot data. lost another hour each to alignment issues and the cable wrap under the structure. managed to get some data towards the end, but the clouds steadily thickened as well. finally worked dusk to dawn. the southeaster and northeaster fought an epic battle early on and left heavy turbulence in their wake. seeing in excess of 5" at times and highly variable. the northeaster was eventually victorious and the seeing settled down to 1.5" or better later in the night. unfortunately, lost almost 3 hours of the good part of the night to primary mirror/SPS problems. observed 7 blocks with 5 accepted. also caught up with all outstanding CAL_SPST. snuck in three quick observations before humidity and ridge cloud had their way once again. in addition the seeing was as bad as i've ever seen with long stretches of 4-5" or worse. on the bright side, i now have a working python interface to BCAM. w00t! another night largely lost to ridge cloud. attempted one block for 2012-1-RSA_OTH-010 before getting closed, but the seeing blew up in the middle of it so had to reject it. first 3/4 hour of the night lost to alignment issues, 1 3/4 hours of science, and then humidity and ridge cloud socked us in the rest of the night. observed a block each for 2012-1-RSA_OTH-003 (rejected because seeing blew up) and 2012-1-GU-003 (accepted).
. Mostly dark night with decent seeing (~1.2-2").
. Mostly dark night with variable seeing (0.8"-3"), the middle part being stable at 1"-1.5".
. Cloudy, stormy night -- unable to open.
. It is with great sadness that we are memorializing SALT Operator Patrick Matshaya. He will be remembered and missed. Our heartfelt condolences go out to his family and friends.
. Dark to gray night with good seeing (1.3"-1.8") and high wind. Closed a few hours early because of wind.
. Half dark, half gray, photometric night with great seeing (1-1.5").
. Data taken for the following programs - many long blocks tonight!
. Dark to grey night with good seeing at start (mostly 1-1.5"); closed before midnight due to high humidity and cloud.
. Dark to gray night with the majority of time lost due to high humidity. clear, photometric night with mediocre to terrible seeing until a sudden wind shift after about 0200. then steady 1.0-1.3" from then until the end of the night. smooth night as well with the only technical issue being the payload falling over once. mirror alignments went much more smoothly than previous nights. accepted 7 out of 9 blocks plus a couple targets that were aborted before any observations. also collected some FP engineering data along the way. cirrusy night with highly variable and sometimes awful seeing. humidity spiked after 1:00 and closed us up by 01:45 for the rest of the night. still managed 10 accepted blocks plus a couple more attempts. very stable night with good seeing start to end. with the exception of a few blips of 1.5-1.7" the seeing was 0.8-1.2" the entire time. mostly clear as well with some light cirrus passing through at times. mirror alignments worked much better tonight. thanks to hitesh for helping out over the phone at the beginning. a total of 10 blocks accepted plus another couple rejected. could have done more if there were more programs with southern objects. almost everything in the 2nd half was clustered on the equator within 25 deg of the moon. not ideal. did acquire some pointing data which showed good repeatability all around the vis strip, but with a large offset from the RSS field center. attempted one for 2012-1-RU_UNC-001, but too much moon. also attempted 2012-1-RSA-005, but moon plus sick SCAM plus PA error made acquisition take way too long that the window was missed. entire night lost to cold front. high wind, rain, fog, and then ice. took a bunch of F-P engineering data to pass the time. wheee! first half of the night was breezy with come and go cirrus. winds picked up in the 2nd half and closed us down eventually shortly after 0300. only successful science data was FT spectroscopy of V2301 Oph for DoD. attempted a couple of FP targets, but bright moon and poor IQ scuttled them. got full sets of FP calibration data for the entire H-alpha region. mirror alignment was once again a struggle and sucked up significant time during both attempts tonight. the timdimm is working now, but only the dimm portion. still need to sort out a computer to run the mass. Mostly clear but windy night with ~1.7-2.8" seeing. Clear, stable night with low humdity and seeing 1.2"-2". Others: Amanda and Paul at the beginning to help sort out the multiple problems. Jonathan over the phone. Cold, rainy, windy night. Did not open. Cloudy and windy night. No observations. Clear, photometric night with seeing ~1.5" ish. Clear, nearly photometric night with 2-3" seeing.
. Dark, clear night with some cirrus at the start.
. Thick clouds and high humidity. No observations. 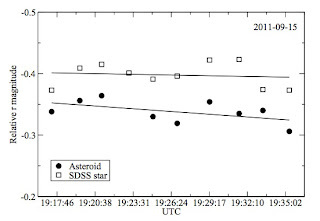 system consiting of a 48 ms pulsar obiting a Be star. re-plumb the SALTICAM cooling system and replace the coolant. mechanisms can be effected at the same time as the re-plumbing. others, please fork the code and contribute to it! well as for the PIPT. addition, you may save and load simulation setups. proposal as a priority 4 one.
. Dark night, practially all lost to high humidity and clouds.
. Dark, clear night with moderate seeing (~2").
. Dark night, with thin to thick cloud, and moderate seeing (~2").
. Cloudy, cold, high-humidity night. No observations taken. => High wind speed, high humidity and heavy clouds finally. 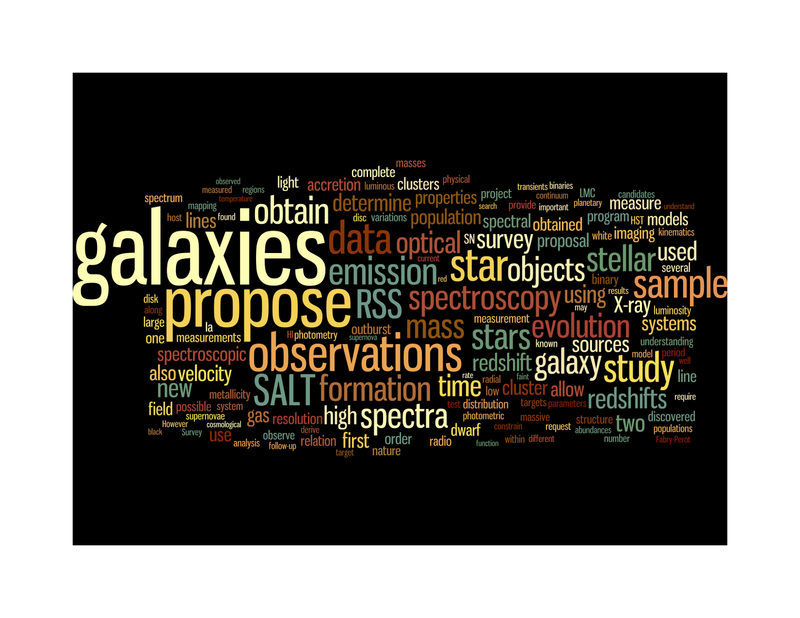 For the second semester of 2012, 102 proposals were submitted from the SALT partners for observations. The first one submitted was by Daniel Holdsworth of Keele University and the last one submitted was by Mickael Coriat of University of Cape Town. A total of 1413 hours were requested from 739 hours available to observe almost 900 different targets. 12% of the proposal request SALTICAM observations and 95% of the proposal request some RSS observations. Over 78 different principle investigators submitted proposals with 260 co-investigators from 83 different institutions, including 8 different South African institutes. 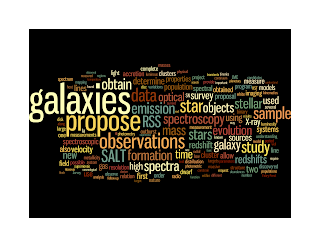 In these proposals, a wide range of different objects are targeted including 538 different galaxies, 244 stars, 60 planetary nebula, 8 clusters of galaxies, and 30 objects of unknown nature. should be announced around the 1st of October with the semester beginning on the 1st of Novemeber. => Unstable night with strong wind and from moderate to bad seeing. Were closed by strong wind. => High humidity and a lot of snow around. No observations tonight. => Snowfall. High wind speed. High humidity. and heavy clouds came later. => Stable night with strong wind and from moderate to bad seeing. => High humidity from the evening. No observations tonight.